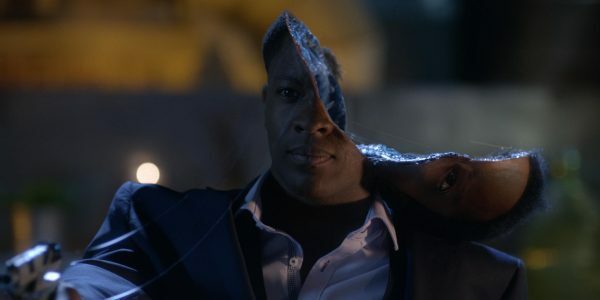 Milk created the digital visual effects for the BBC’s Doctor Who Christmas special: “The Return of Doctor Mysterio”. The one-hour episode aired on BBC One and BBC America on Christmas Day 2016 and in cinemas in Australia. Our main focus was the creation of a photo-real CG, modern-day New York environment with skylines and aerial views, seen during the day and at night. 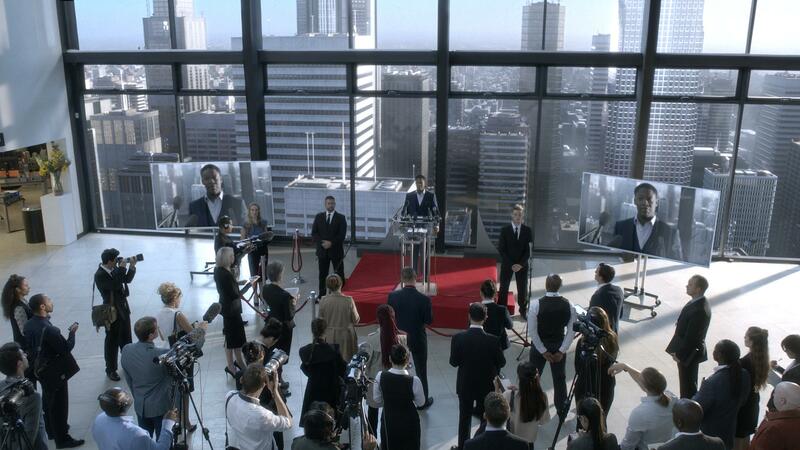 The brief was a realistic look with comic book fantasy tone. 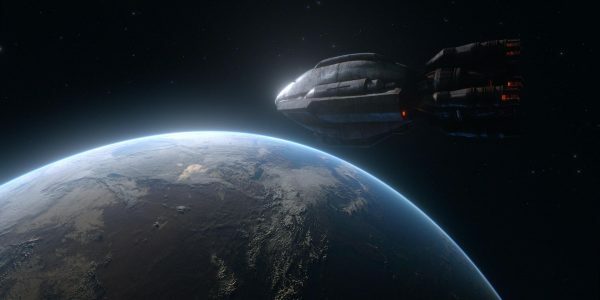 The team made 100 visual effects shots in 4 weeks, with a prior 4-week asset build. 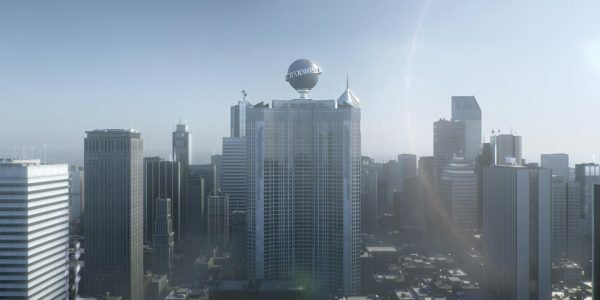 Our environment team created a full CG New York cityscape environment, used throughout the episode, with specific buildings – the Empire State Building and the fictitious ‘Harmony Shoal’ Building. We created libraries of skyscrapers, smaller apartment blocks and high-resolution assets such as the Empire State and Harmony Shoal buildings. Once these were positioned we built libraries of elements to add detail: Rooftops were populated with antennae, aerials, chimneys and air-conditioning units. At street level we added several kinds of streetlights, shops and newspaper stands. The urban areas were broken up with tree-lined parks and the interior of the skyscrapers populated with interior set-dressing such as office chairs, desks, lamps, decorated walls and computers. To add layers of movement we populated the streets with a variety of animated cars. To enhance the realism of each shot we added atmospheric fog and interior lights for the buildings. Finally, we shot a series of panoramic photographs from the top of the Empire State building at different times of day, to create day and night cycloramas, which we dropped in behind the 3d asset to provide the sky and furthest buildings along the horizon. 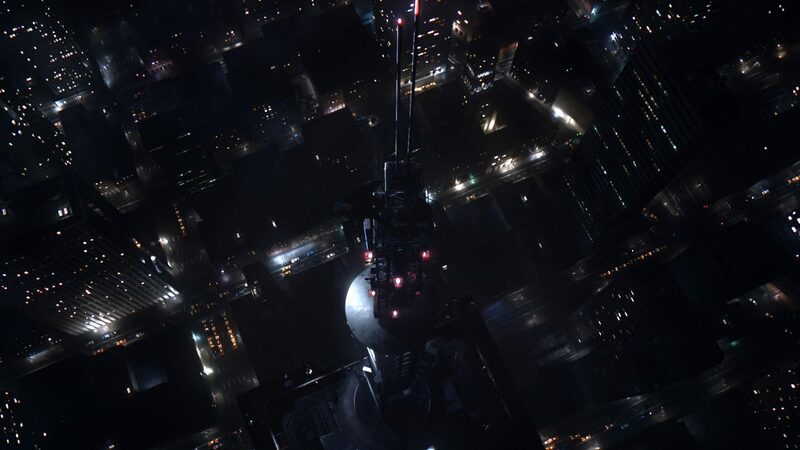 A challenge was creating a look that ensured overall city continuity during both day and night fly through shots. Our environment team also created panoramic views of New York using a mixture of photographic and 3d elements. These were generated at extremely high resolution, printed out as translights and used during filming to provide backdrops to match the 3d assets created for our fly-over shots. These were also used as backgrounds for shots where we look out over the shooting location for New York. For Lucy’s exterior apartment shots for example we used our dmp asset build to extend the location and add scale and depth, seen when she is standing on the roof. 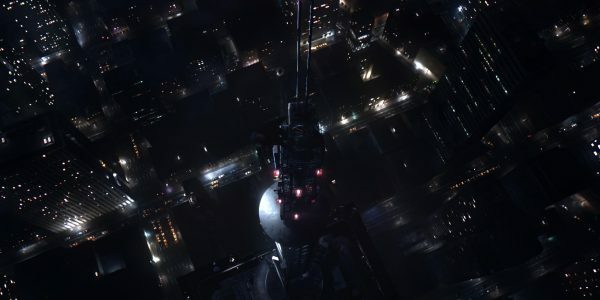 Described in the script as a ‘terrifying vertiginous’ shot, The Doctor and Young Grant are revealed clinging to the antenna atop the Empire State Building. A practical antenna was shot on its side with Peter Capaldi on top and Young Grant underneath supported by decking. Milk created a CG model of the entire Empire State building and surrounding environment. We replaced elements of the practical build and continued the camera move in a digital take over, swooping up and away to reveal the entire building from above with the Doctor and Grant at the top. We made a variety of shots showing the actors flying, taking off and landing amid the New York cityscape. For the flying sequences the actors were shot on wires or boards in the studio with practical enhancements such as wind machines and wires attached to cloaks and coats. The Milk team composited the green screen elements of the actors into our CG New York night-time skyline environment whilst accommodating a variety of dynamic camera moves. 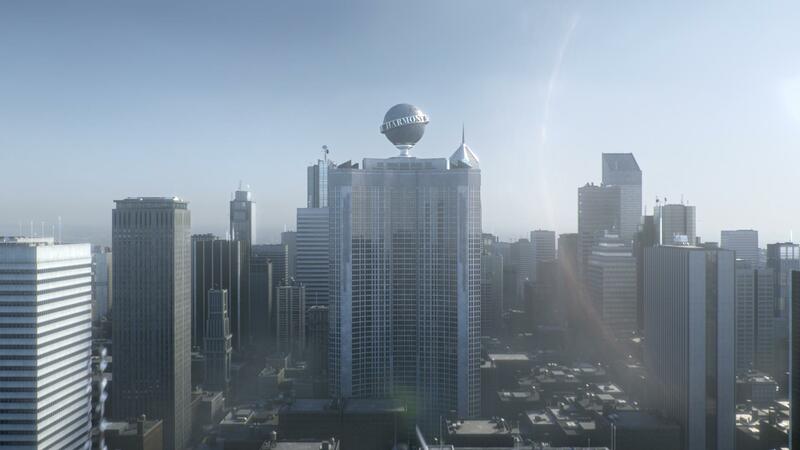 We created a CG skyscraper of the Harmony Shoal building and the spinning globe on top in homage to Superman’s Daily Planet building. This hero building is seen at different times of day and required a high level of detail to support close up camera moves. In the night-time sequences the interior is visible with a variety of tiny office spaces filled with chairs, tables and computers. We created multiple face replacement shots for the characters Sim and Brock when each removes the top half of his head. 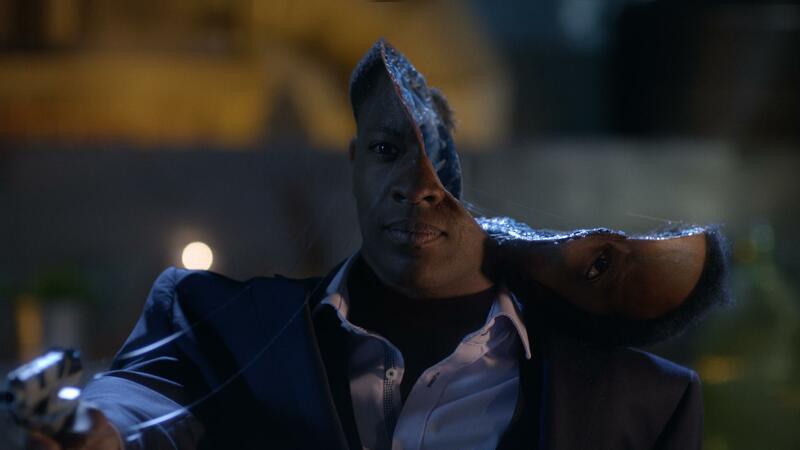 The compositing team mixed the prosthetic model with the live action plate of each actor. It was a technical challenge to digitally match their movement and integrate the two seamlessly while enhancing the prosthetic to look as realistic and creepy as possible. Built to match the BBC’s practical counterpart we added detail to the back engines and undercarriage and textured it with layers of rust, grime and dirt to give a worn out appearance. 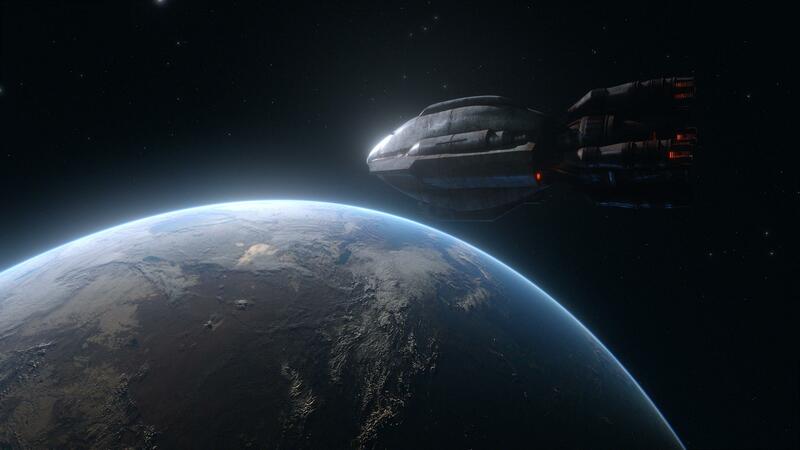 For shots where the ship is seen in space, we rendered views of the Earth using a physically accurate atmospheric shader to provide the correct colour and glow. We recreated a CG Alien brain with animated eyes to match the look and lighting conditions of the practical brain prop, which was submerged in a water tank on set.